Merton Council has shocked people with crude and damaging plans to construct floodlit sports pitches in local woodland and on the site of former tennis courts in the heart of the conservation area. The development contradicts the Council’s own planning policies to protect wildlife, avoid light pollution and care for local heritage. Mitcham Cricket Green Community and Heritage has campaigned for the old tennis courts in the grounds of the Canons to be brought back to life. One of our objectives is to encourage recreation and this community facility has stood idle and wasted for years. Now it faces the prospect of being lost forever as Merton Council has plans to develop two “multi use games areas” and floodlight them till 9.30pm every day and all year round. Eight towering floodlights will be erected and a swathe of woodland will be lost from the nearby and much loved copse. The Council’s own reports show that such development can have a devastating impact on the local bat population. The light pollution will also have a highly damaging and urbanising impact at the heart of the Conservation Area. The grounds of the Canons are valued for their sensitive lighting and quality of the night time landscape. This was recognised in the development of the Cricket Green Charter and is enhanced by the Council’s own policy deliberately to provide subdued lighting in the area. The planning application even fails to provide any guarantees that the new facilities will be available for use by the local community. With underused facilities already available nearby at the KNK Stadium and Cranmer School it is no surprise that a Council study of sports pitches concluded that provision in Mitcham is “significantly better” than elsewhere in the Borough. There is no excuse for such a devastating development. We are asking Merton Council to think again and return with plans to restore the old tennis courts for use in daylight hours by local people. We are even offering to help with the fundraising. Read our full views on the plans for floodlit sports pitches at the Canons. If you agree, let Merton Council know your views – the information is at Merton’s web site here, and you can submit your views online here. 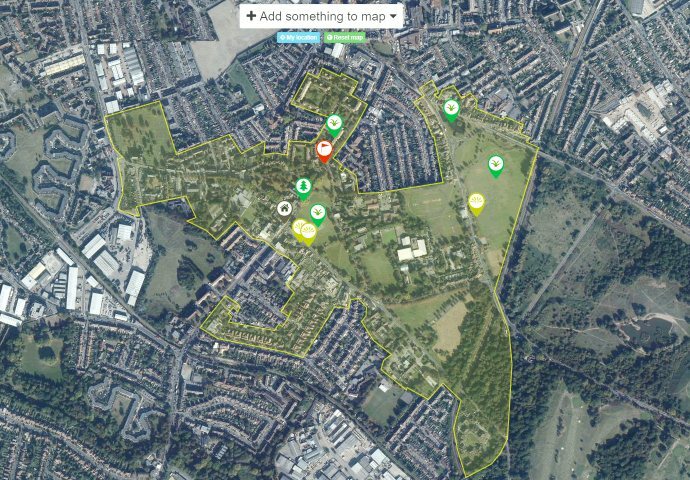 This entry was posted in Cricket Green Conservation Area and tagged Canons, floodlights, MUGA, Planning Applications, tennis courts on August 9, 2013 by mitchamcricketgreen.